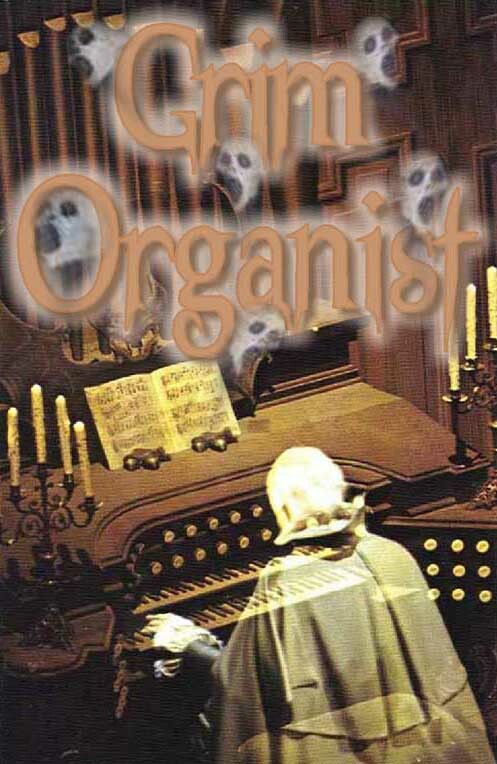 The origin of the Grim Organist can be traced back to Doug Ferguson and Phantasmechanics. 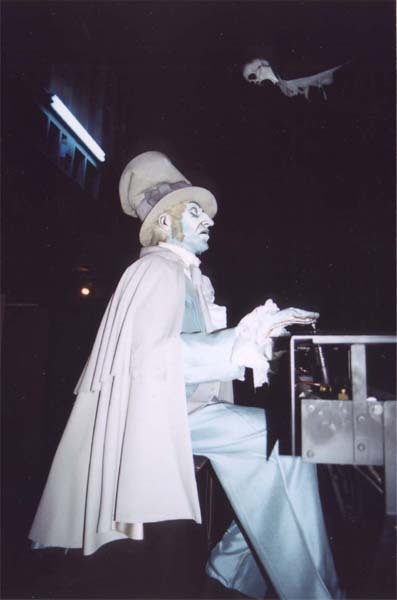 Doug's experimental animatronic was then realized by Tom Marchak's Ghostly Grim Organist Baron Flesh Von Riptopen; Dan Oberley's Grim Organist; Brent Ross' Skeletal Organist; and Mike Fox's Nimble-Fingered Organist. 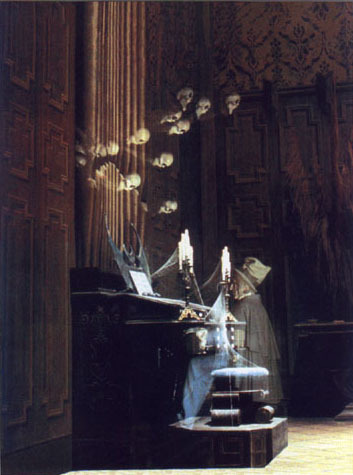 Ever since we first saw a Grim Organist, we've envisioned building a “replica” (well, at least a close approximation) of the pipe organ in Disney's Haunted Mansion. 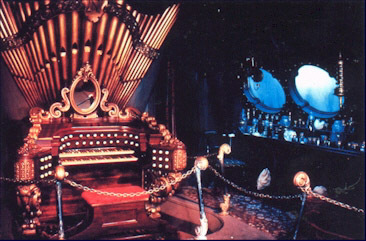 From the first three pictures, you can see that the Haunted Mansion organ was originally used in the making of 20,000 Leagues under the Sea and is sometimes referred to as Nemo's Organ. 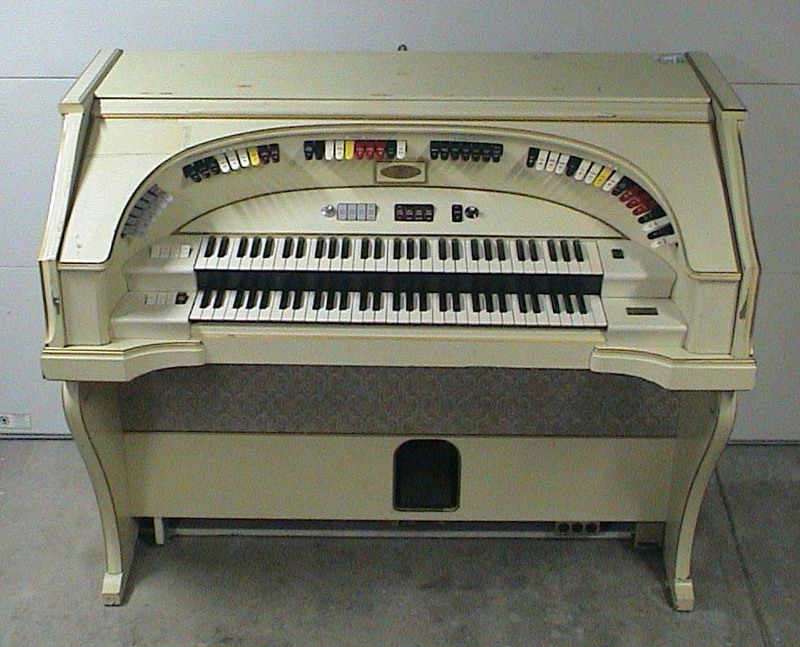 It’s a Wurlitzer 4520. 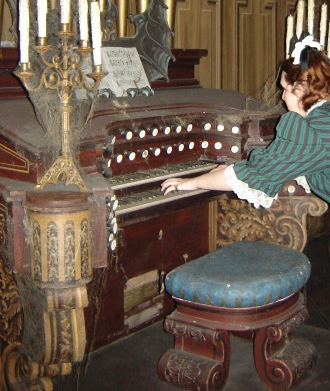 We found it in the parking lot of our local Colton Piano & Organ. 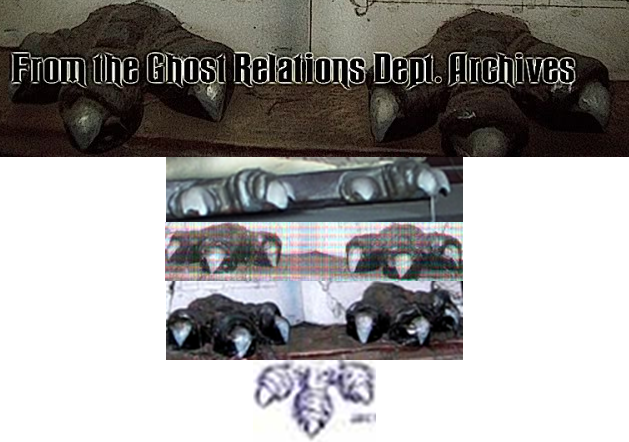 Who knows how long it had been there. 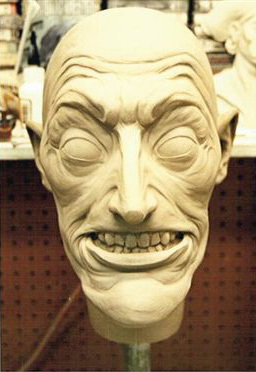 We were told that if we hauled it away that we could have it for free. 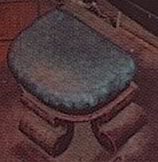 The funny thing is that when we got it home, it actually worked! 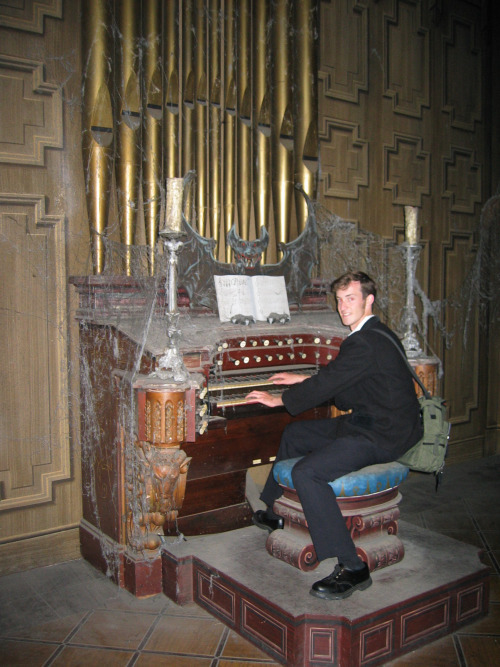 We have gutted the organ. 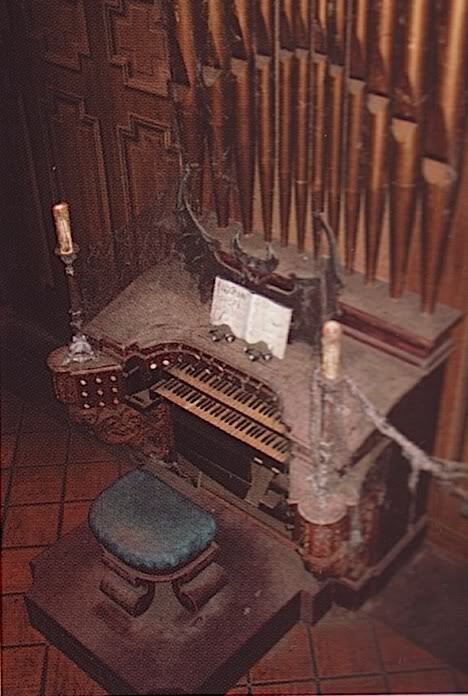 The organ was filled with rather dated, bulky electronics. 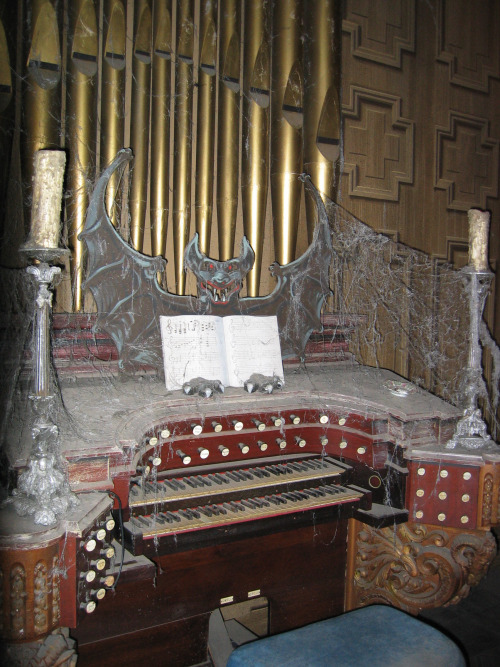 We removed all of the electronics in order to lighten up the organ. 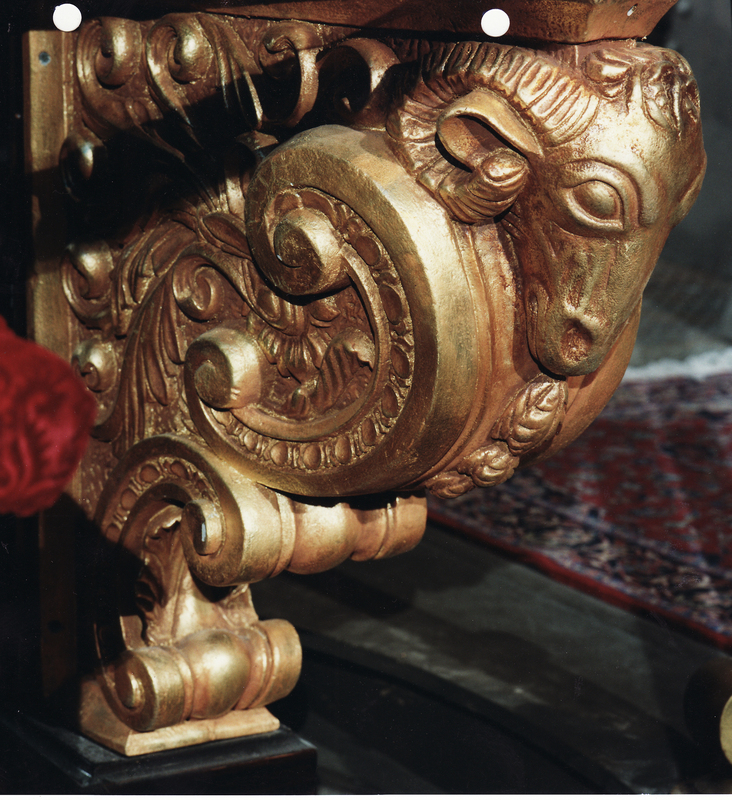 There are six speakers (including two sizable woofers) that are mounted behind the cloth under the keyboards. 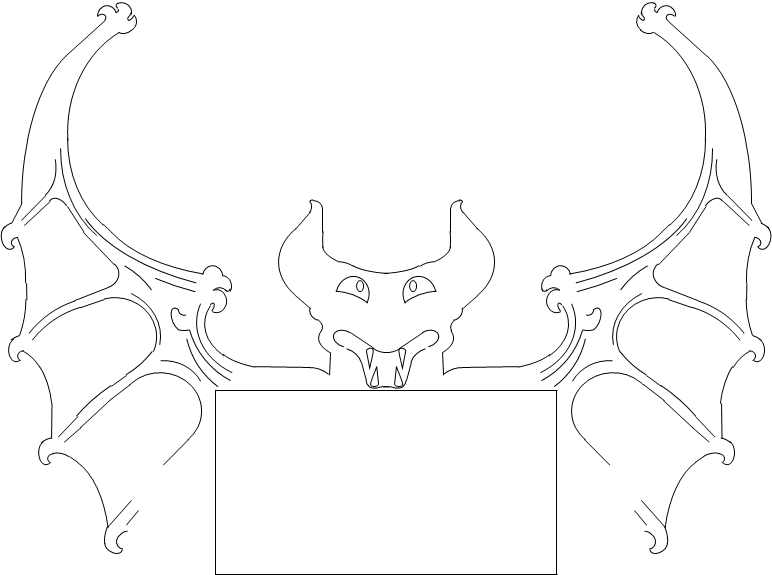 We plan to preserve the speakers. 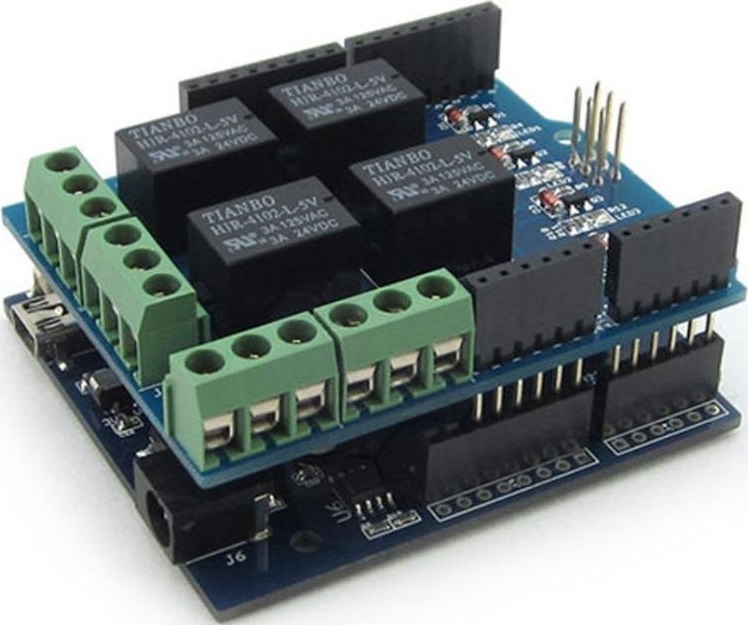 We have bought a pair of three-way crossovers from Radio Shack that we hope to use to re-wire the speakers. 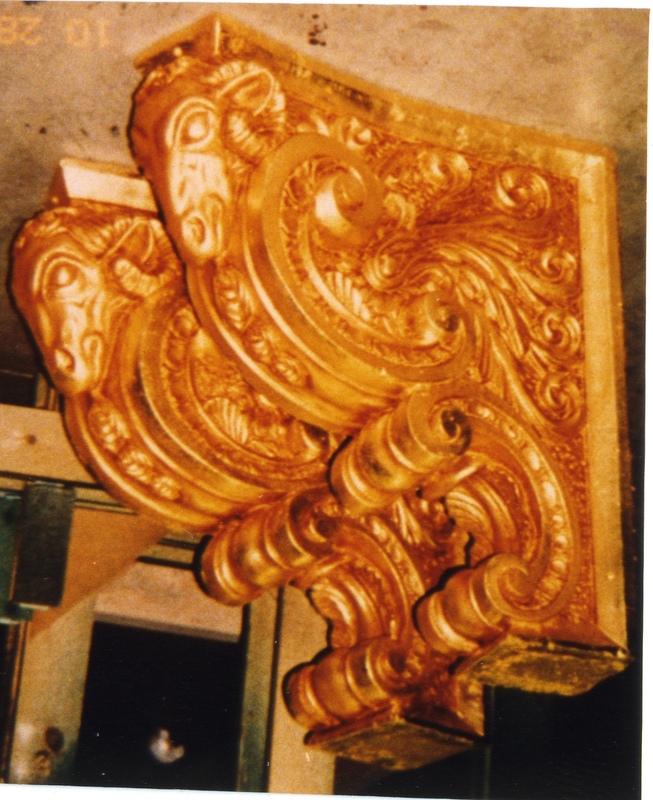 We plan to strip the paint from the organ and stain the underlying wood. 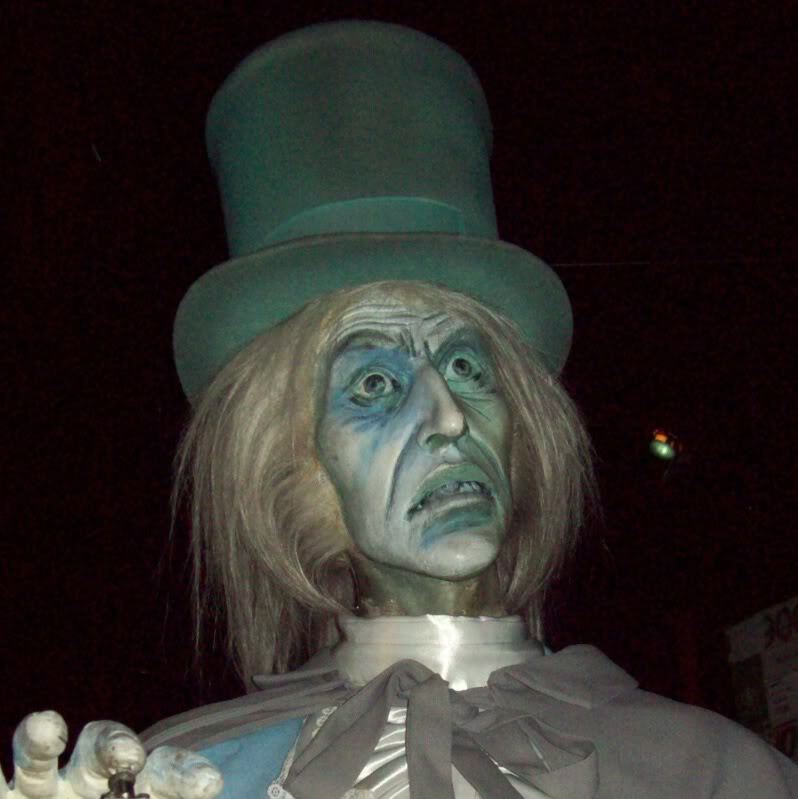 – Please let us know if you’re aware of affordable corbels similar in size and style to the corbels used for the Haunted Mansion organ legs. 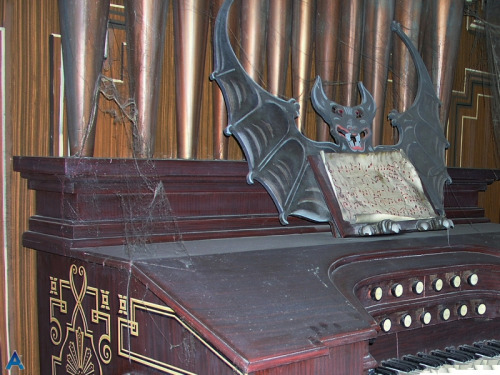 These photographs are from Grafton Piano & Organ. 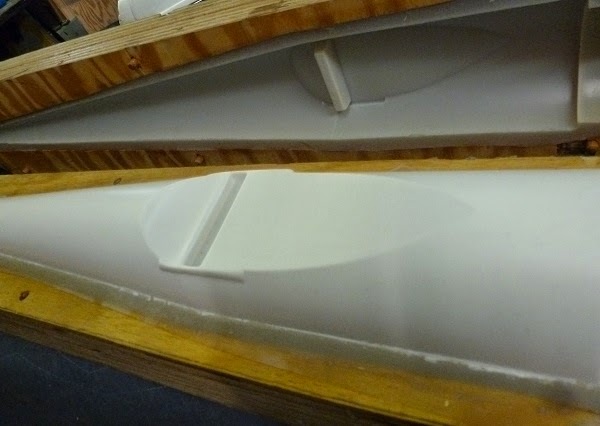 This is an excellent technique, however, you must first secure real organ pipes from which to make the mold. 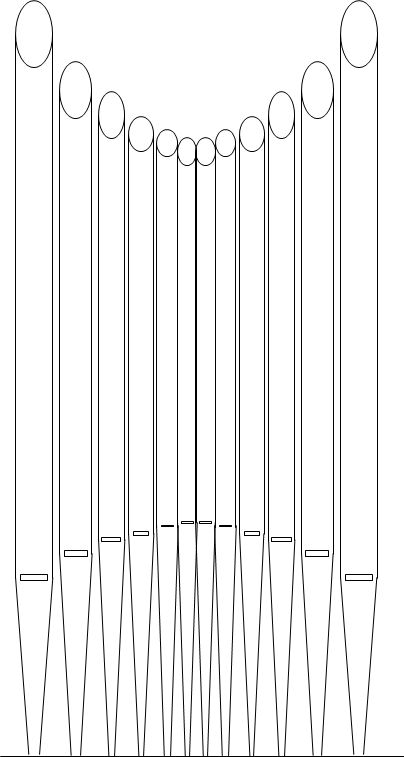 Ideally, we’d like two organ pipes in each of six different diameters. 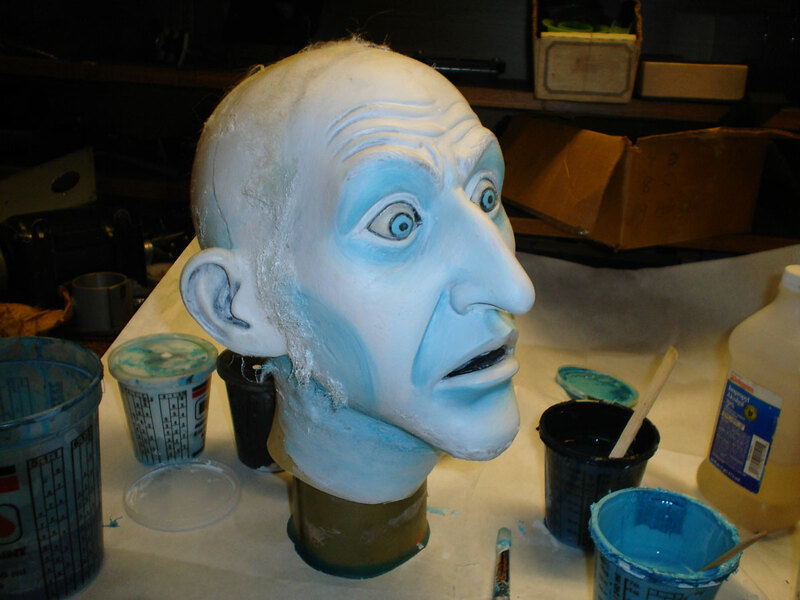 It’s hard to justify the time and cost of making six molds to only pull two casts of each mold. 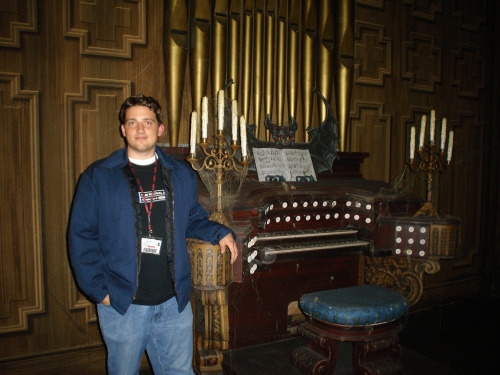 – Please let us know if you’re aware of design plans for making faux organ pipes like the Haunted Mansion organ pipes (pictured above). 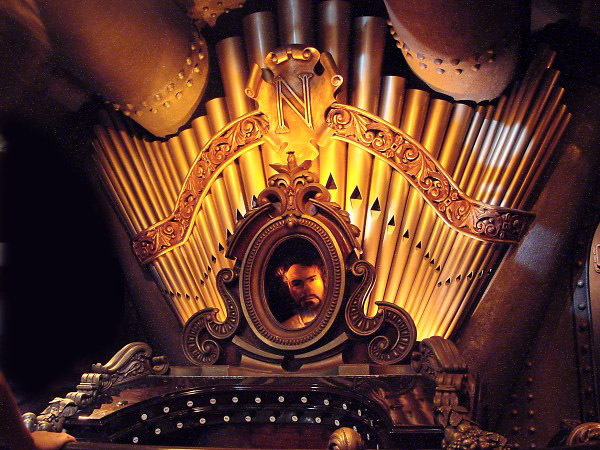 The pipes will sit in a “wind chest” mounted on top of the organ. 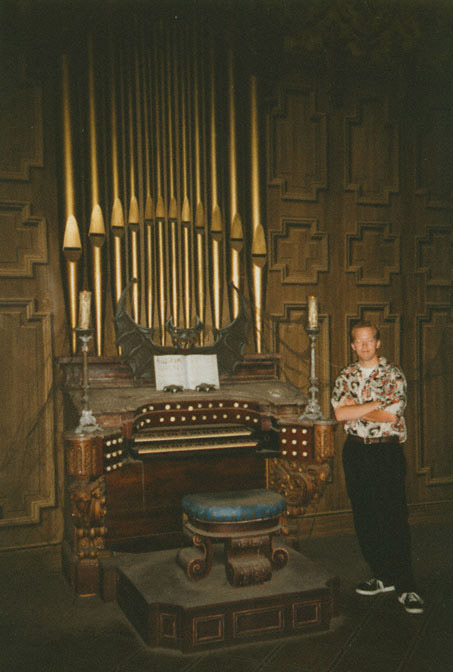 We plan to build out the front of the organ, including the "boxes" to the left and the right of the keyboards. 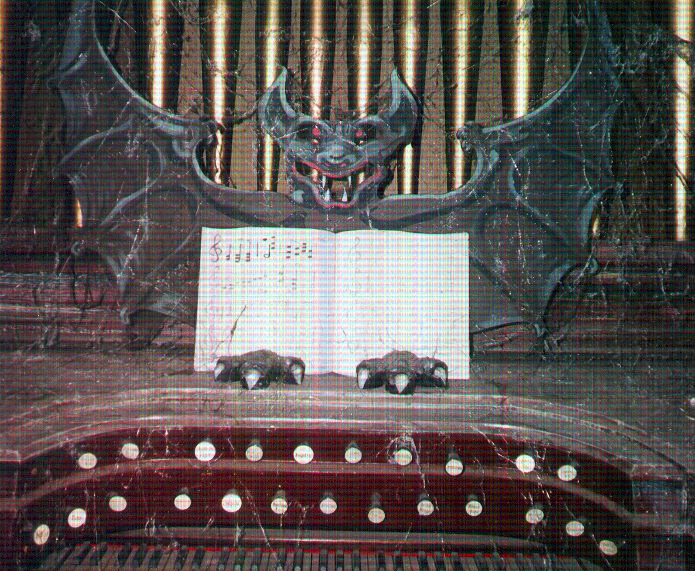 Disney’s Haunted Mansion organ bench is very ornate. 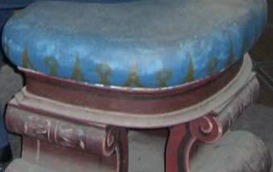 We certainly don’t expect to incorporate this level of detail in our bench, at least not in the initial conjuring. 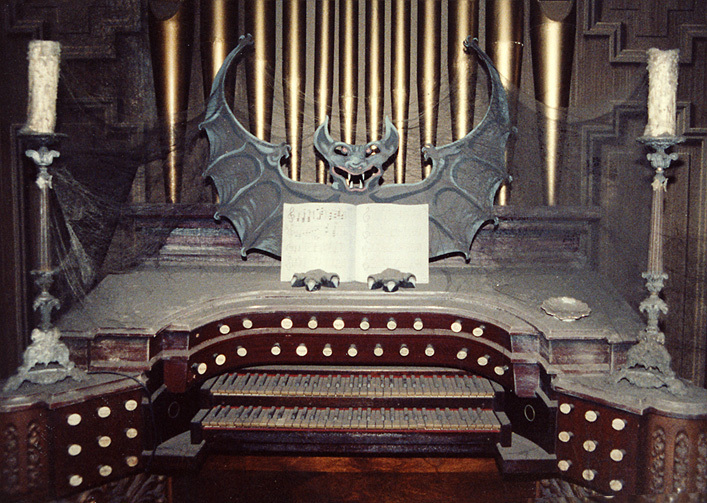 – Please let us know if you’re aware of an affordable bench similar in style to the Haunted Mansion organ bench. 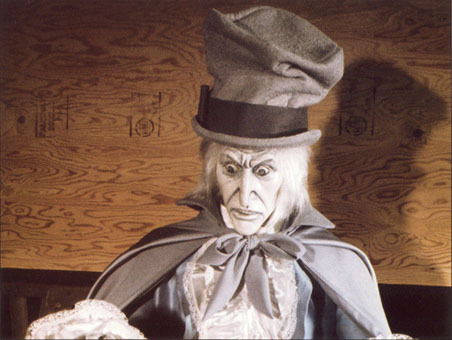 This illustration is from Haunted Dimensions. 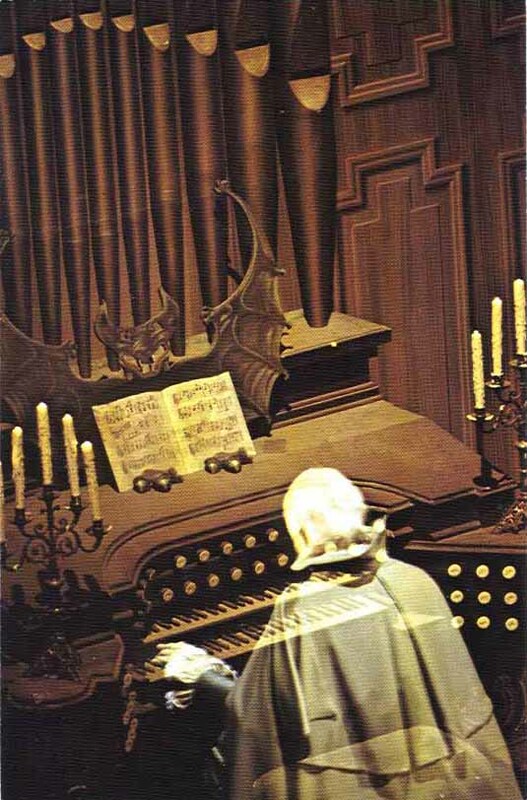 The organist is animated out of sight of the audience. 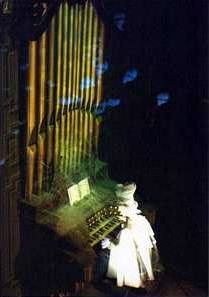 The audience views the reflection of the animated organist through a large piece of glass. 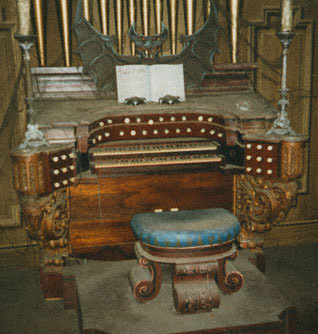 A cylinder would be connected between the organist's spine and his crotch in order to lean the organist forward. 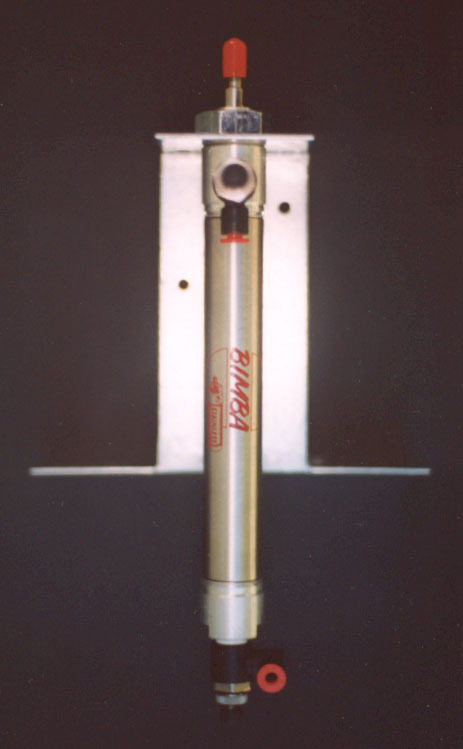 One cylinder would nod the head and a rotary cylinder would rotate the head. 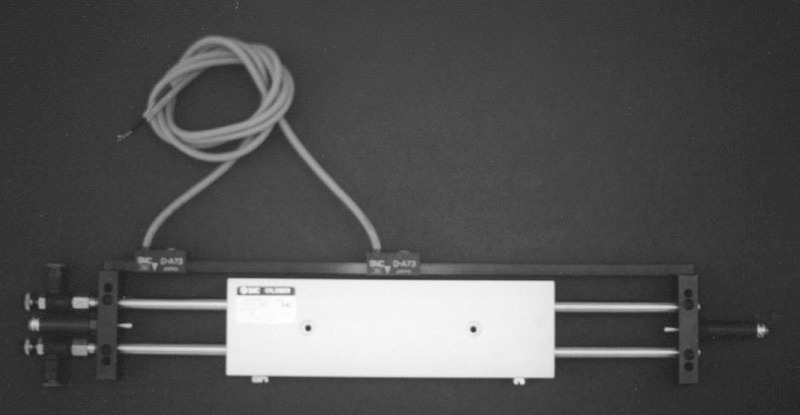 We’d use a combination of five-port, three-position and five-port, two-position solenoid valves. 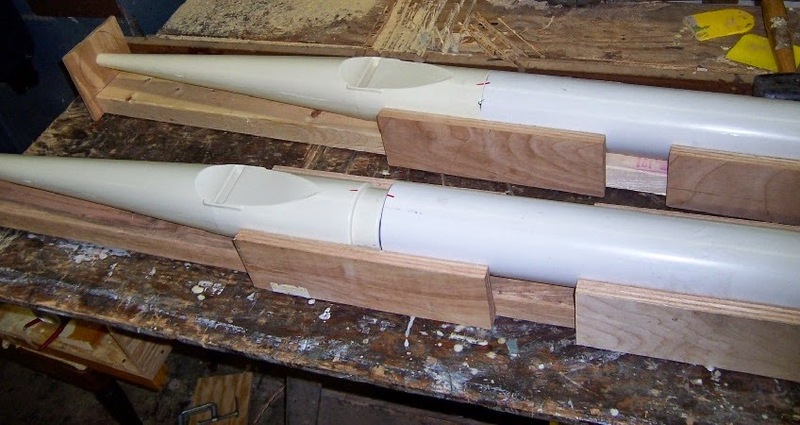 The five-port, three position solenoid valves would be used in conjunction with those cylinders over which we hope to have digital control. 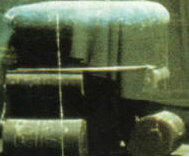 Of primary importance are the cylinders that would move the hands left and right and the rotary cylinder that would rotate the head. 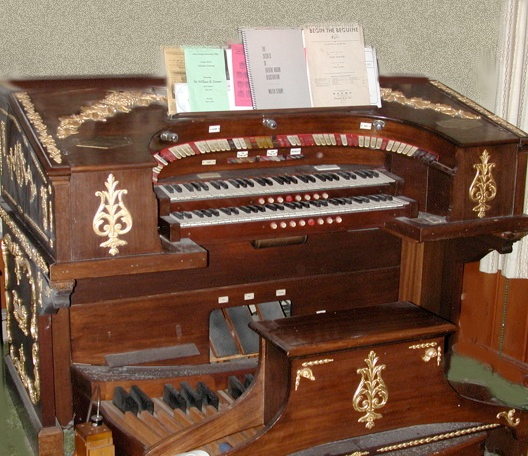 Small solenoid valves and air cylinders would be used to animate several organ keys corresponding to each hand. 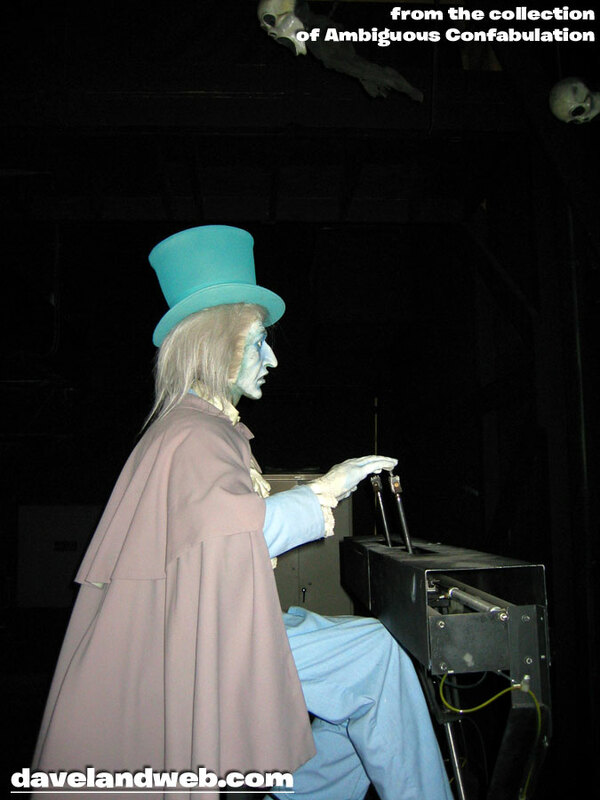 · Tip of the (Reggie) Hat – The use of Pepper’s ghost illusion pays homage to Disney's haunted organist. 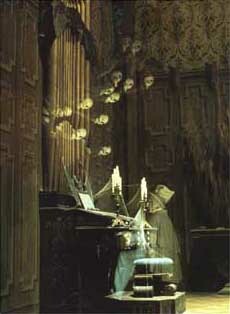 · Ghostly – The reflection of the animated organist in the glass creates a ghostly image. 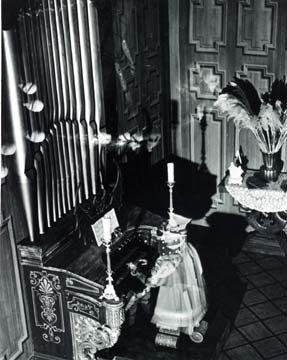 Controlling the lighting between the main viewing room and mirror-image room will make the organist gradually appear and disappear. 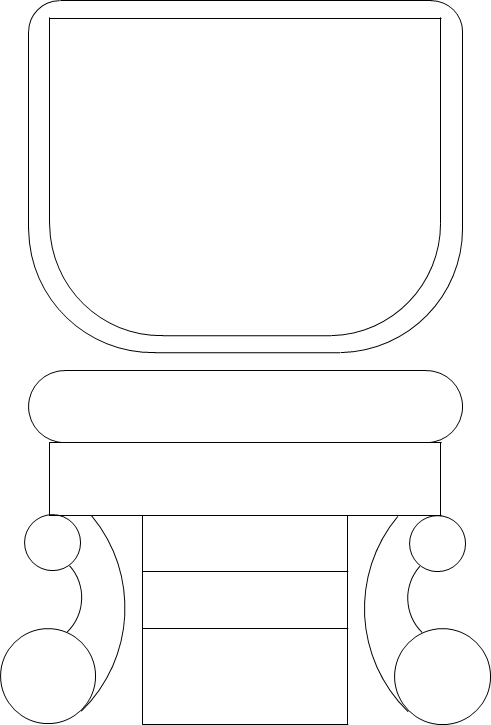 · Cost – At a minimum, we’d need a 5’ 8” x 8’ piece of glass (or Plexiglass) with a main viewing room of only 4’ x 4’ x 8’. 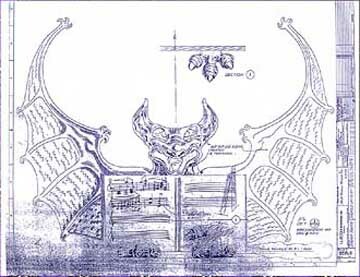 You have the cost of a body form and the cost of pneumatics to animate the organ and organist. 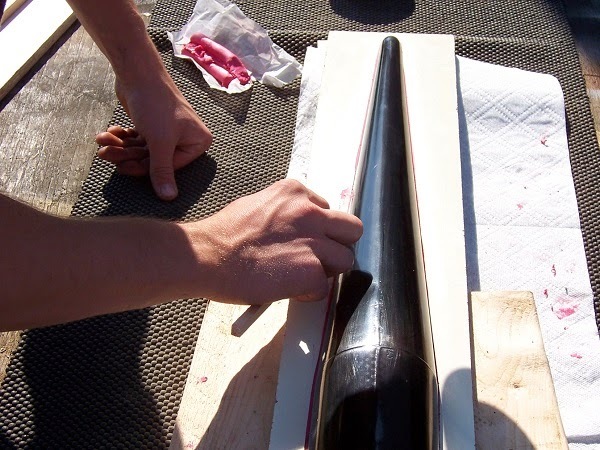 · Handling / Storage – Handling and storing such a large piece of glass will be a nightmare. 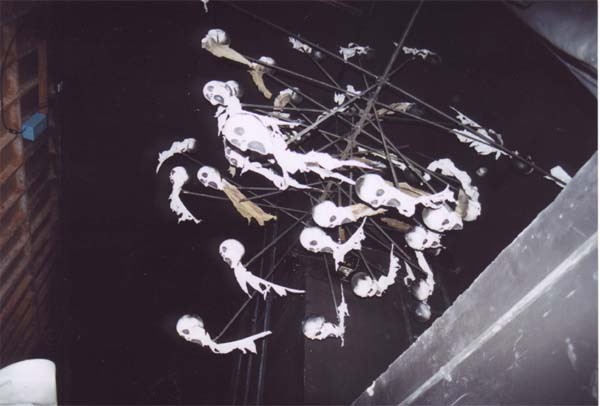 Plexiglass would alleviate this concern slightly. 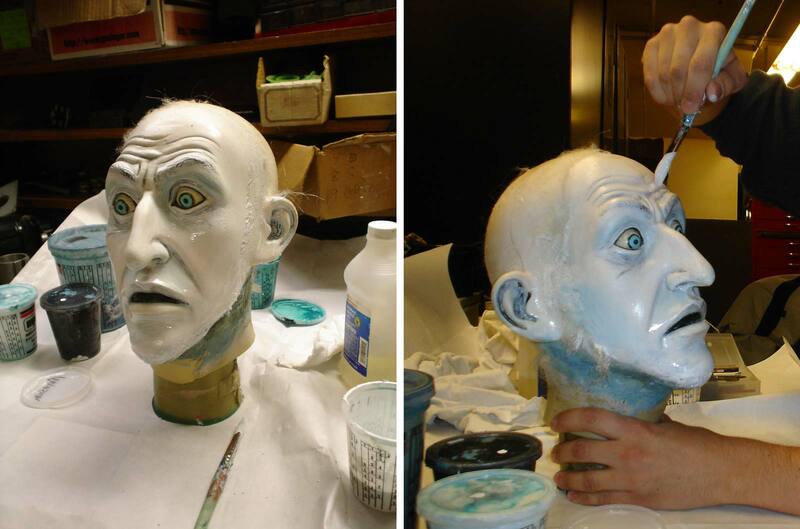 · Complexity – Achieving lifelike movement using pneumatics is extremely challenging and requires ongoing maintenance. 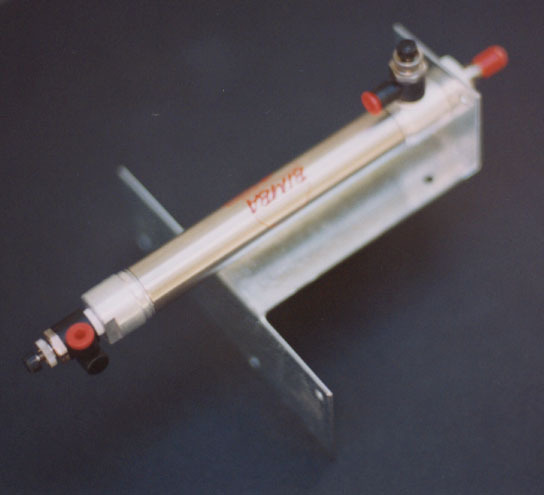 Our second consideration was the use of “Pneumatics in Direct View”. 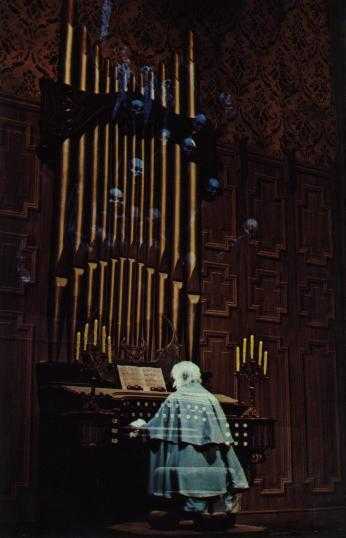 In other words, the organist would be animated using pneumatics in direct view of the audience. 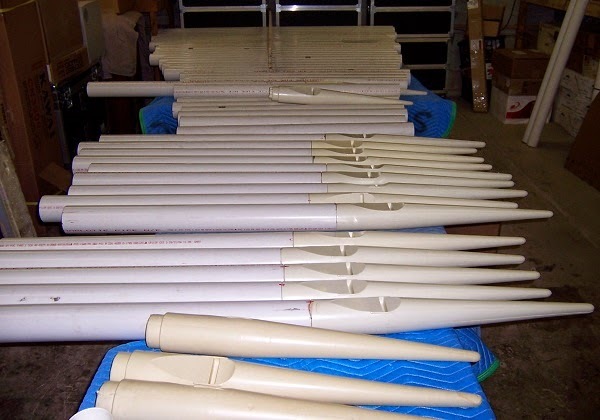 · Less Expensive; Easier Handling / Storage - Eliminates the cost and handling / storage headache of using glass or Plexiglass. 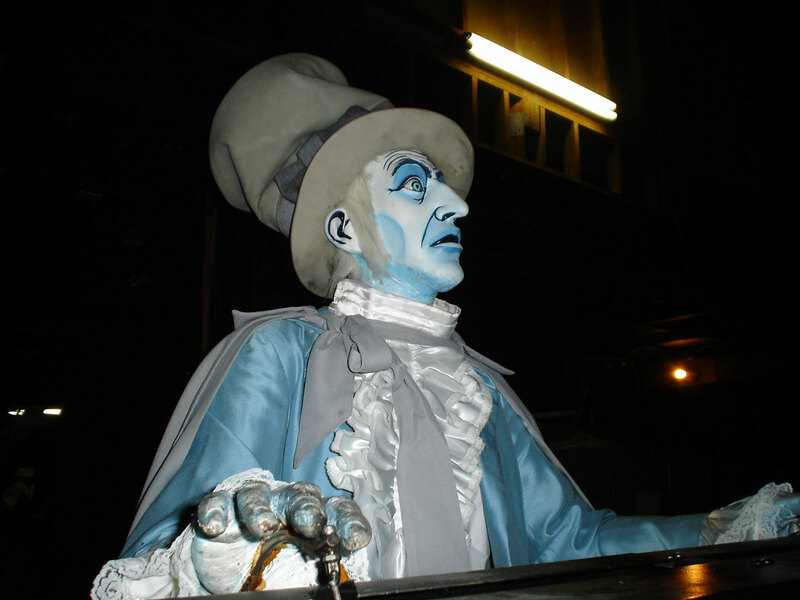 However, you still have the cost of a body form and the cost of pneumatics to animate the organ and organist. 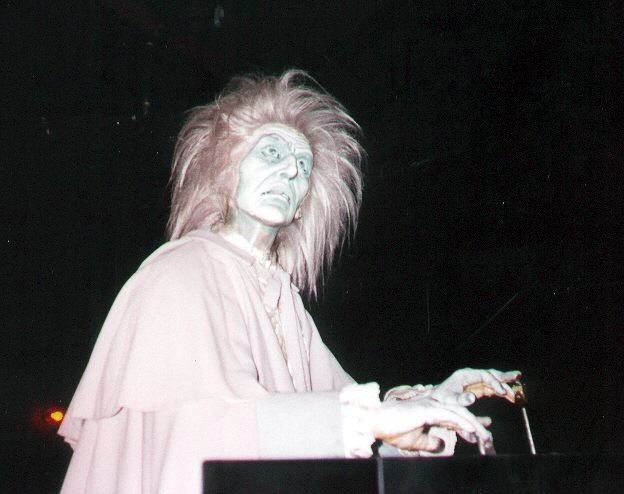 · Ghost Busted – The ghostly nature of Disney's organist will be lost. 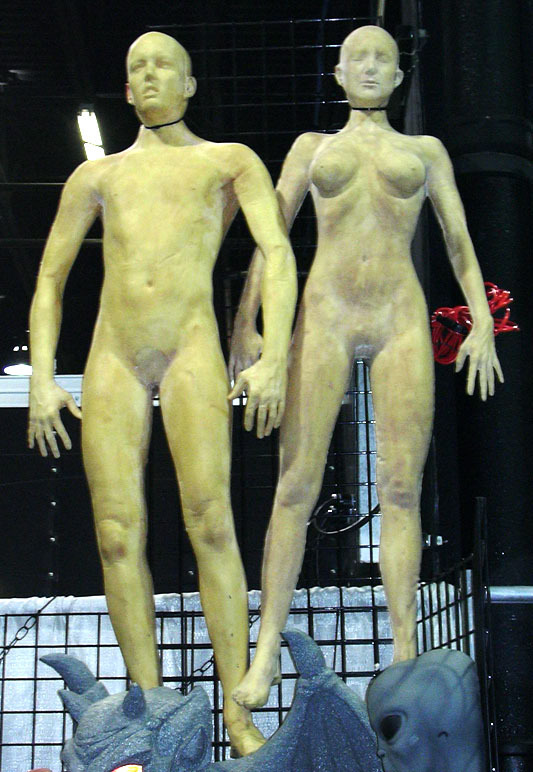 · Complexity – You still have the challenge of achieving lifelike movement using pneumatics. 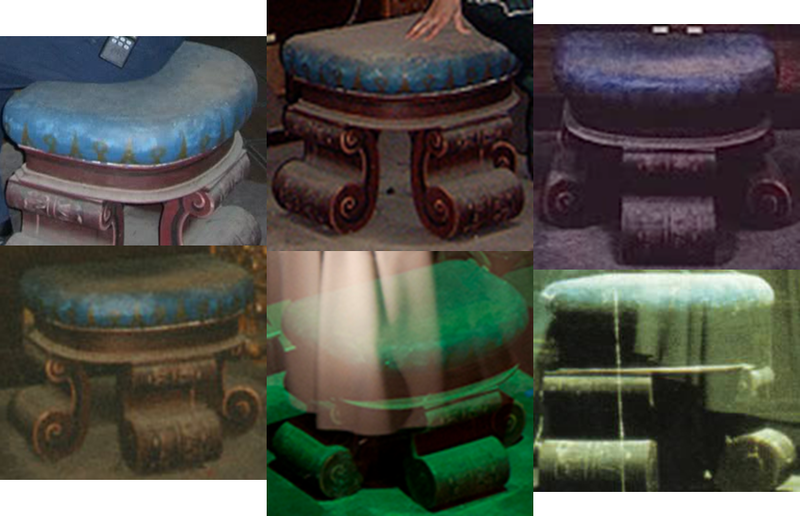 We’re leaning towards the use of a “Hologram” projection. 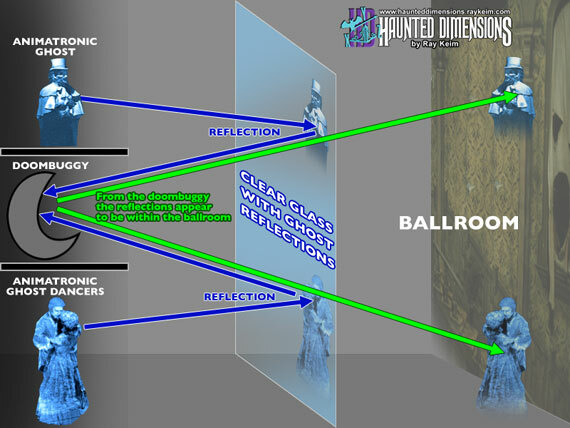 By definition, a hologram is a three-dimensional image. 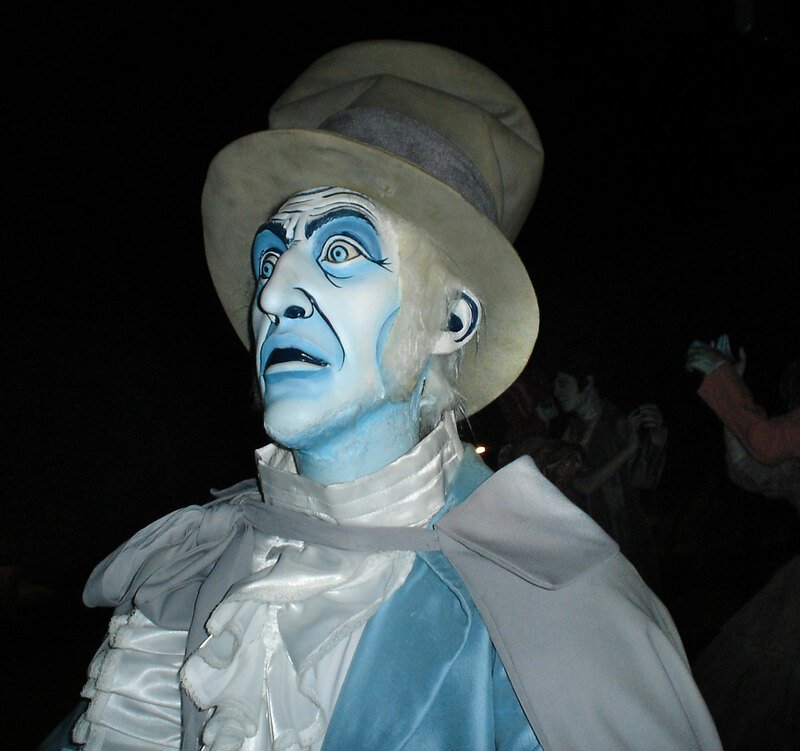 Stage illusions such as Pepper's ghost are often mistakenly referred to as holograms. 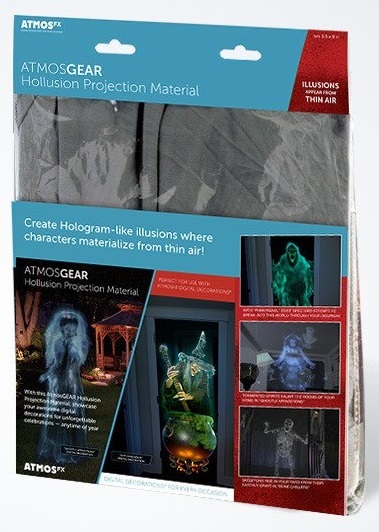 AtmosFX appropriately uses the term “hologram-illusion” or “Hollusion” to refer to such images. 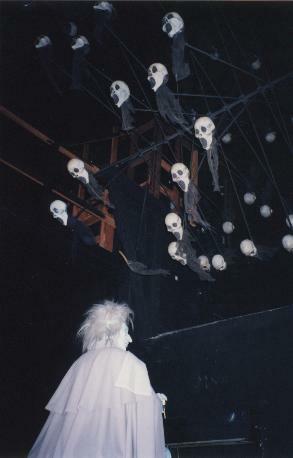 The video will be projected on scrim stretched in front of the organ. 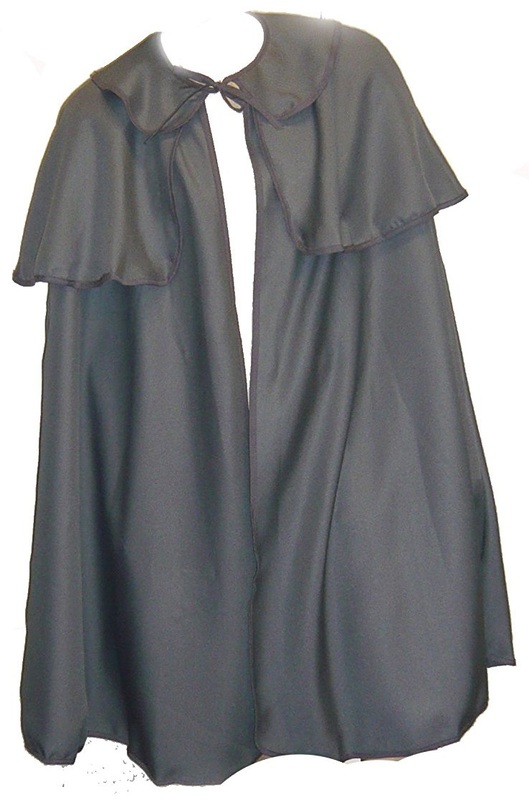 · Less Expensive – Scrim is inexpensive compared to glass / Plexiglass and readily available in much larger sizes. 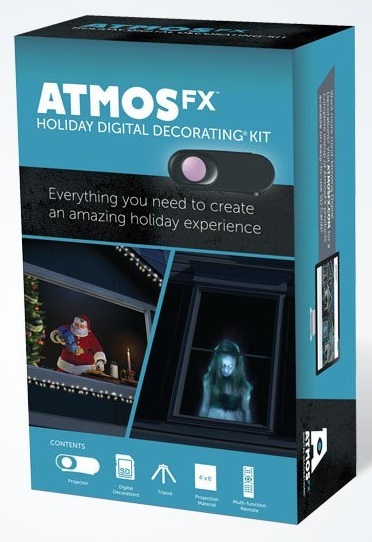 A projector and triggerable media player should cost less than $200. 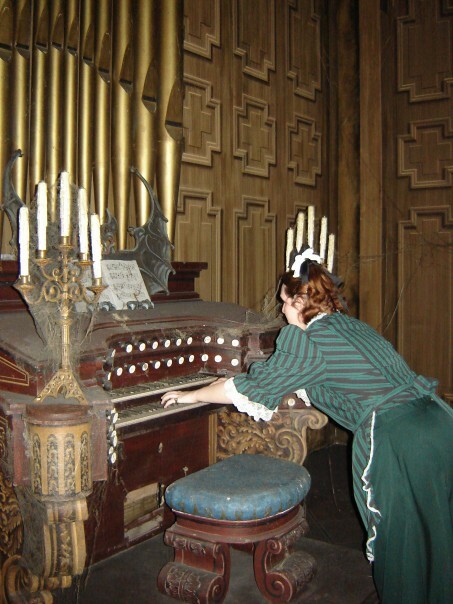 Videoing a live actor eliminates the cost of a body form and the cost of pneumatics to animate the organist. 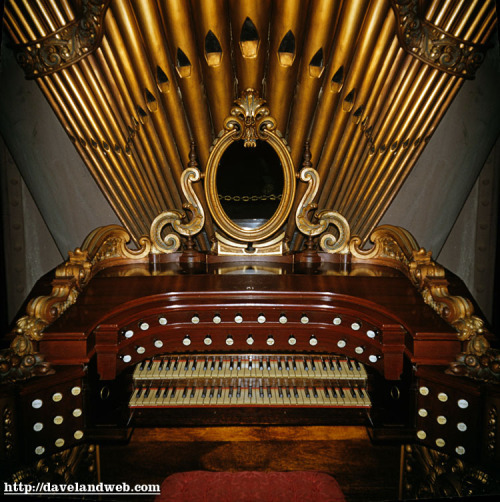 · Lifelike – The video will preserve the lifelike movements of the actor videoed playing the organ. 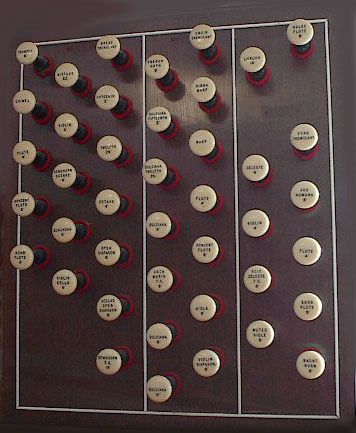 · Less Complex – Only the organ keys will be animated, rather than the organist. 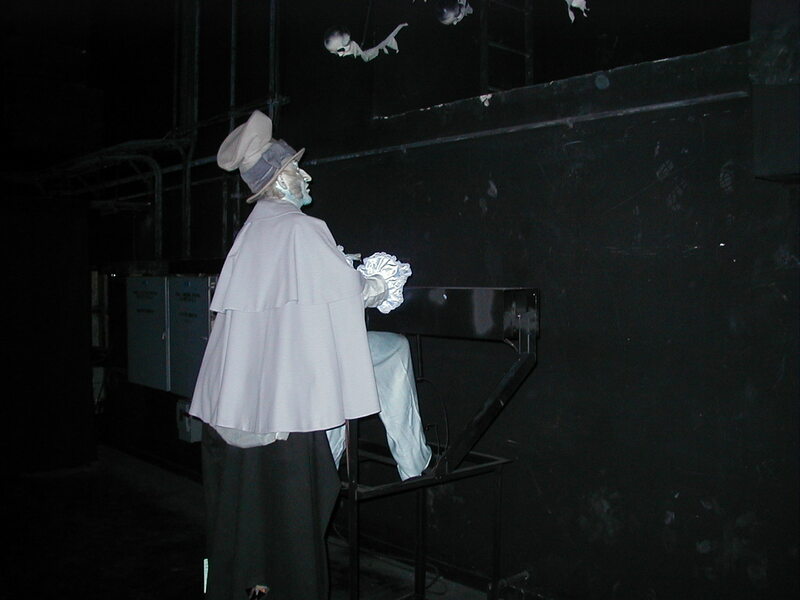 There’s far less maintenance with a solid-state projector and media player. The HDDK will reportedly have a HDMI input, is due out Summer 2017 and will retail for $189.99. 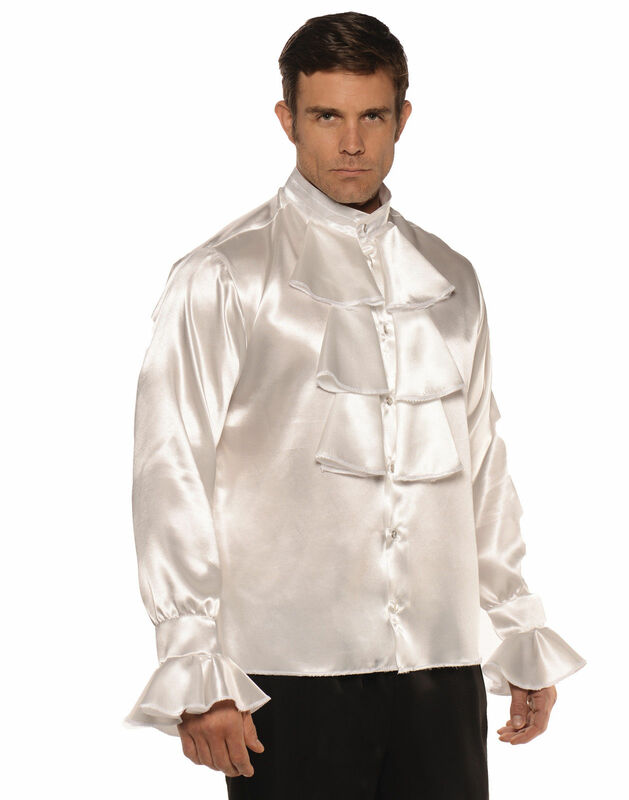 Obviously, far less expensive projectors are available on eBay. 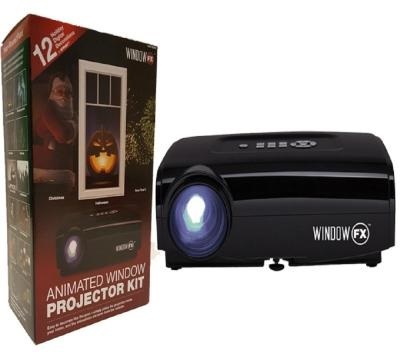 However, the WindowFX Projector Kit doesn’t have a video input. 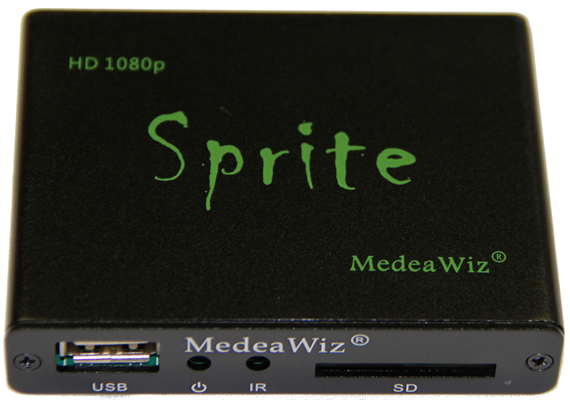 * - Bill Kingsley at Team Kingsley LLC is offering the MedeaWiz Sprite to HauntForum members for $69.00 (limit 4) until March 15, 2017. 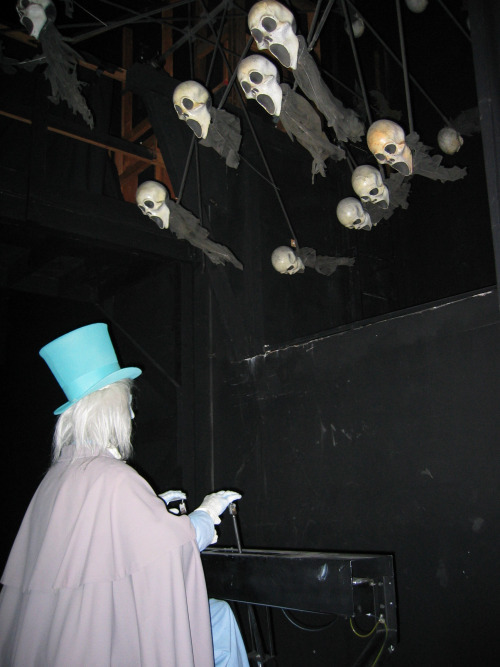 The Uno will control the media player / projector and animate / sync the organ keys via the solenoid valves / air cylinders.